Below are updated versions of the charts from the original post. 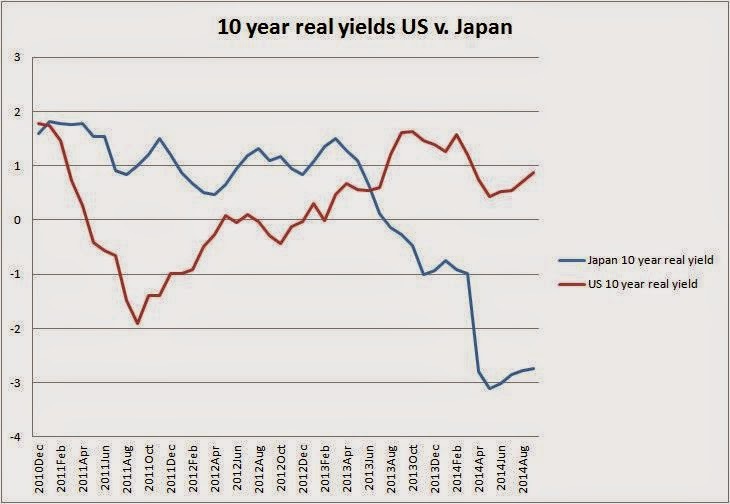 As you can see the divergence between US and Japan 10 year real yields has continued as expected. In addition, the correlation between this differential and the USDJPY pair has been steady (with the more recent October, November movements not shown). With both monetary policies on opposite courses, these trends should continue. Here at First Crown we've been fortunate enough to interview Ryan J. Morris, president of Meson Capital. Based in San Francisco, Meson is an entrepreneurial activist hedge fund that invests in proven businesses undergoing inflection points that they identify or cause. For more information on Meson, please visit their website:www.mesoncapital.comEnjoy! What has been your best trade in terms of an annualized return, and what was that story like? It’s been almost a year since our write up on Mindspeed, (they did get taken out and the calls were a great return), but with summer coming, we’re going to try to post more frequently. We’ve been reticent as well because we were still building a position in a certain security, in which we were the only ones buying for months. We speculate that that we were buying from an investment bank who was hedging their own positions, hence the reason why the opportunity even existed. A lot of investors today are vocal on being short the yen; however we haven’t come across a single retail investor that has provided a strong way to profit from the widow maker prophecy. It’s interesting to note because youtube videos and chat rooms have people commenting on gloom scenarios, but why talk the talk if you’re not going to profit from it? Bergdorf’s doesn’t accept street cred.